Providing the structure for organizations, teams, and individuals to focus, finish, and improve. As individuals, teams, and companies, we are so distracted, have so much work in-flight, and are constantly negotiating deadlines, that we can't focus, finish, prioritize, or even plan our day. Personal Kanban is an award-winning productivity system used by companies and agencies world-wide that allows your team and you see your all work in flight, prioritize and plan, focus and finish. When all around me seems to spin out of control, it is so refreshing to turn around in my seat and see my Personal Kanban board waiting for me…If I do nothing else but LIMIT MY WORK IN PROGRESS, I already begin to breathe easier. The grace of this system cannot be overstated. - Dan L.
CORPORATE SALES: Interested in purchasing the Personal Kanban class for your team or organization? You're not alone. Please contact us directly to receive special pricing for group enrollments. Ask about our six-step corporate classes - have Jim and Toni work directly with your team remotely. Save money, your teams learn better over time, and implementation is sustainable. Need to sell it internally? Download this One Sheet. How can I say "No" without upsetting someone? How can I make promises I can keep, if I'm always being interrupted? How do I set time for myself, do I always have to work in the early morning or late at night just to finish? How do I let my boss and coworkers know I'm overloaded? How can I share work with others more effectively? I know my work, why are my estimates always off? This course solves these problems and more. I've been using Personal Kanban for a couple months now at work and at home, and I couldn't be happier with how much more focused and impactful my work is. This is a powerful, flexible system that I highly recommend to anyone who needs more clarity and definition in their work stream. - Tony S.
This course is taught by Jim Benson, the creator of Personal Kanban and co-author of the Shingo Award-winning book that sparked a productivity movement. Jim and his Personal Kanban co-author Tonianne DeMaria are pioneers of applying Lean thinking to knowledge work and have helped clients in over two dozen countries implement the principles of Personal Kanban, including organizations as diverse as Starbucks, Spotify, the United Nations (Vietnam, France, Italy), Riot Games, the World Bank, State Farm, Statoil (Norway) Sparebanken Vest (Norway), JP Morgan (Scotland), H&M (Sweden), and Comcast/NBCUniversal. complete projects rather than just start them. communicate better at home and work. work in teams that need to finish complex projects on time. see and improve on their work. show others their workload so they can have a sane and responsible day at the office. This course awards 5 PMI PDUs and is the equivalent of 5 hours of class time for other certifications. Spend an hour with Jim or Tonianne focusing on your specific work. Jim and Toni will work with you personally in a series of 3 one-hour video calls (a $1500 value) to understand your work, find the best strategies to limit your work in process, and build a foundation for success. For bulk sales or corporate rates Drop us a line. Join Siemens, Turner Construction, Columbia University, and our other corporate clients. This method is like magic! I have improved my productivity without being overly concerned about it. My working spaces have become more organized, which really helps reduce stress. 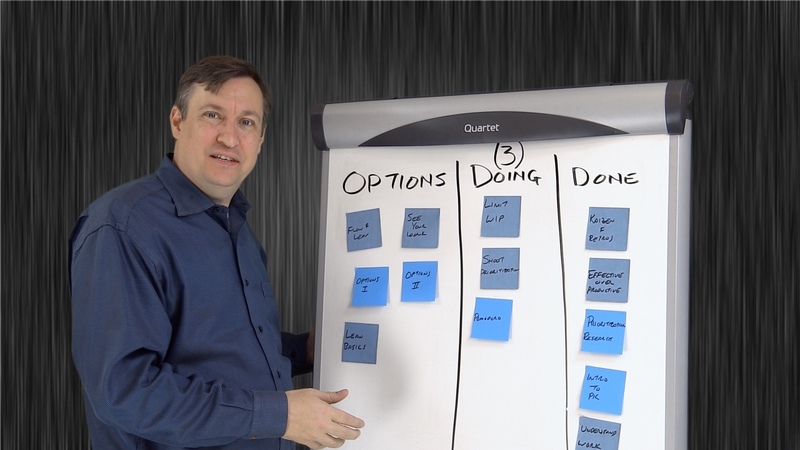 - Paul W.
The course includes more than 20 videos, over 2 hours of self-paced instruction delivered by the authors of Personal Kanban: Mapping Work/Navigating Life, the award-winning book that began a productivity movement. You also get access to our discussion forums where you can get your questions answered by Jim and Toni.